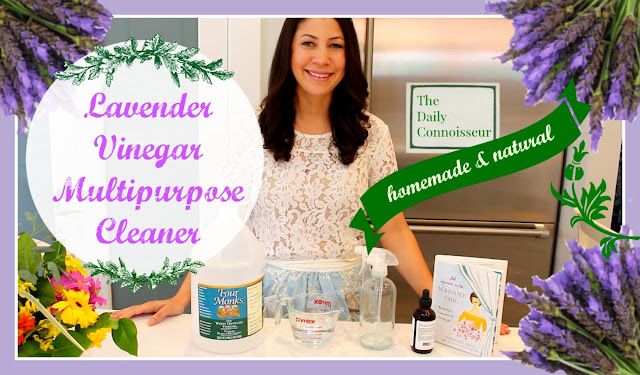 Today I'm making the homemade lavender vinegar multipurpose cleaner I write about in At Home with Madame Chic . This has been a highly requested post, and I'm happy to share it with you in today's video! Pour all ingredients into a spray bottle, and store in a cool, dark place. In this video, I use the glass spray bottle and Majestic Pure Lavender Essential Oil, both of which can be found on Amazon. You could also find very affordable plastic spray bottles at many dollar stores. If you've never cleaned with vinegar before, it might take a while to get used to the scent. The lavender oil cuts through the pungent vinegar. I actually love the way this smells. To me, it's the scent of "clean". Lavender also has many disinfecting properties, and has long been used as an element in household cleaners. I hope you enjoy my video today. Please let me know if you make your own cleaning solutions at home. What are your favorites? 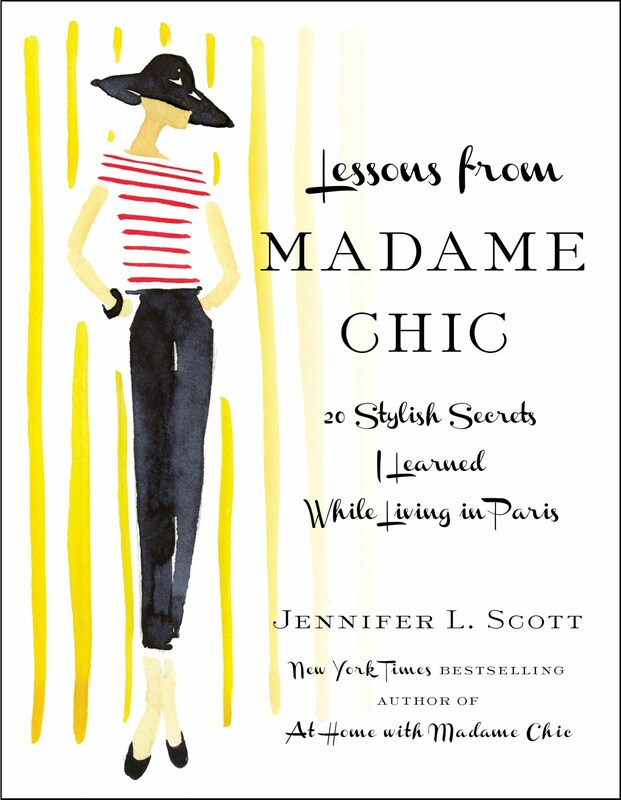 A French Collection shares Lessons from Madame Chic as one of their favorite books. Hi Lara, so many people compare their lives to what they see from others on Facebook. This is such an unfair comparison. I generally find that people only post the positive aspects of their lives and rarely share the darker times. It is the same as comparing yourself to what you see in a fictional show on television. My advice to your friend would be to focus on the blessings in her own life and not compare herself to others. Maybe a hiatus from Facebook is also in order! 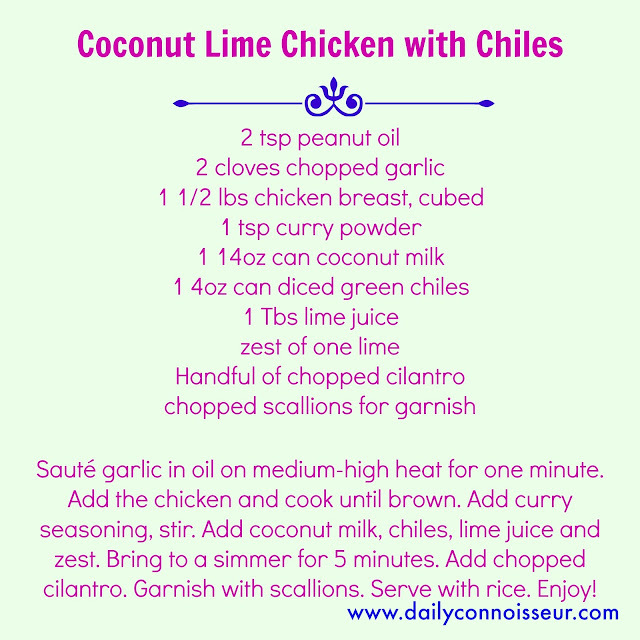 Today I'm sharing one of my favorite quick and easy curries, Coconut Lime Chicken with Chiles. 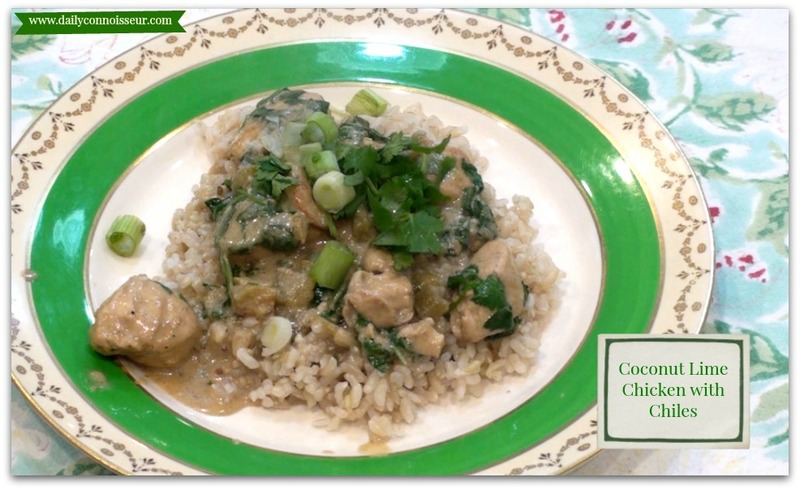 This recipe has been adapted from Robyn Miller's Quick Fix Meals, a wonderful cookbook. This recipe serves four, and can easily be doubled. Your Sunny Funny Face shares her capsule wardrobe, inspired by the ten-item wardrobe and Lessons from Madame Chic. I've been reading your books and blog for a few years now, and it's your authenticity that inspired me to adopt a 10-item Wardrobe, put down my phone at lunch, and cultivate poise even when you fear standing out. I really appreciate your honesty with this video, and the others. Whether or not you have a chance to click over to my blog, I just wanted to let you know that you've inspired me to write about my process and experience with the capsule wardrobe, and share the concept of a "less is more" lifestyle with my friends in college. It is easy for us, college students, to become consumed by the idea of having more. After all, our school attendance is often driven by a desire to have a well-paying job in the future so we can afford all that we want. I have no idea if it will shift the culture of my school, but I have observed how you shift the culture among women--mothers, businesswomen, writers, bloggers--and hope that perhaps I can pass on that same impact to at least one person at my school. Thank you, Mary Grace, for letting me know about your blog chronicling the capsule wardrobe! I have shared it in my news item above. I hope you have fun compiling your capsule wardrobe! Many people have asked if I will be having spring ten-item wardrobe videos coming up and the answer is yes! I have recently shot videos on the subject and you will see them in March. Have a wonderful weekend and I will see you on Monday. Come along with me today as I get my (long overdue) haircut. You get to meet my wonderful stylist, Adriana of Adrimar Salon in West Los Angeles, hear my hair loss updates, and much more in today's vlog. When discussing my postnatal hair loss with Adriana, she showed me these Bosley Hair Thickening Fibers, which conceal the sparse areas in your hair. This was a really helpful trick! Be sure to watch today's video to see the full vlog. I hope you enjoy coming along with me for a day in the life. Thankfully, by now, my baby is much, much better. He was suffering from an ear infection when I shot this video. Sweet and Simple Home shares her favorite YouTube channels and The Daily Connoisseur is on her list! Beyond Words writes about her capsule wardrobe process and mentioned Madame Chic and the ten-item wardrobe. I religiously follow your blog, and eagerly watch your weekly posts! I'm a bit behind this week, I've trained myself not to "sneak" and watch your weekly blog. I have learned to slow down, grab a drink of choice, sit at our (clean) kitchen table, and press play. It seems silly, but three+ years ago I would NOT have done that. I would have rushed through, multi-tasking, and somewhat paying attention to your video. I was behind doing a few "me" things this week, but I told myself that it's okay to wait to the perfect moment to watch. Thank you for aiding me in being a housekeeper, parent (leading by example by a tidy home/routines), and being able to think smarter and not harder when it comes to daily things like wardrobe and preparing meals. Lindsay, thank you for your comment. Thank you for sharing your journey with us. It's true, when you do things mindfully, the experience is much more satisfying. I'm so happy that my blog is a source of joy for you! 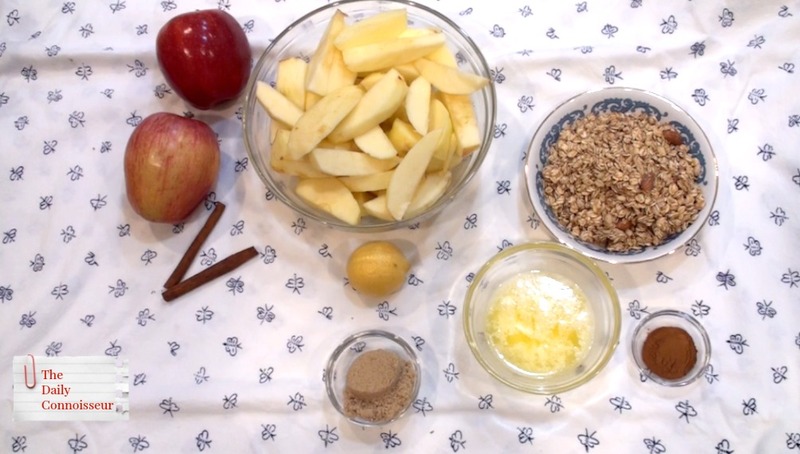 Thank you to everyone who shared their enjoyment of my Apple Breakfast Cobbler recipe. See you on Thursday for another recipe video! Today I'm showing you a slow cooker apple breakfast cobbler that you can assemble the night before. Feel free to make substitutions. Instead of butter, you can use coconut oil. You can use coconut sugar instead of brown sugar. Or you can omit the sugar entirely. This recipe is very customizable. My kids love this breakfast and when we serve it with a dollop of vanilla yogurt, it tastes like a decadent dessert! Be sure to watch my video today to see how to make this easy breakfast. April, thank you so much for your kind note. 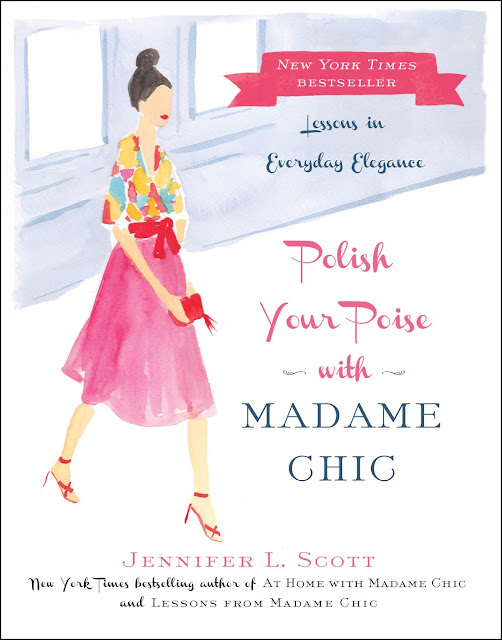 I hope you enjoy the other two Madame Chic books! Have a wonderful weekend, everyone. I'll see you on Monday! This year, as promised, I am bringing you reviews of affordable, high-quality, drugstore makeup. High quality is not always synonymous with a large price tag! On Facebook, I asked many of you for your favorite drugstore recommendations. Some of you recommended L'Oreal True Match Lumi as a dupe (comparable, affordable replacement) for Giorgio Armani's Luminous Silk Foundation. You know I love my Luminous Silk, so I was intrigued! How does this drugstore foundation compare? I let you know in today's comprehensive review. I initially purchased the foundation back in December, used it for over a month, and came back to let you know my findings. The bottom line: it's a great foundation. With one swipe of the pad, you get very light coverage. Or you can build it with two or three swipes for more coverage. The biggest advantage of this foundation is the price. It is typically sold for around $17, but if you use a coupon (like I did at CVS) you can get it for a significantly reduced rate. You can also find it on Amazon for around $12. The blush I'm wearing in the second half of the video is L'Oreal True Match super-blendable blush in subtle sable. 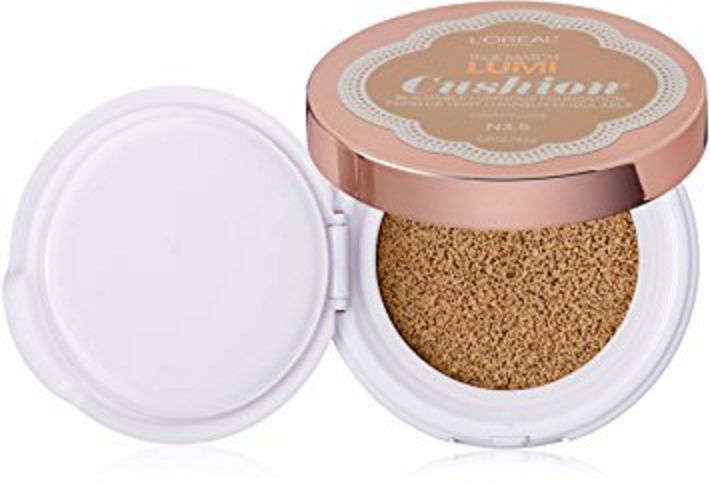 To see all of the shades for Lumi Cushion, visit the L'Oreal website here. You can watch my video this week to see the whole review. I hope you find it helpful! Polish Your Poise with Madame Chic is going into its 4th printing with Simon & Schuster. Thank you, readers! This comment comes from a review of Lessons from Madame Chic on Amazon. Oh I loved this book, but how to put it into practice? I am an English lady, living in the USA and married to a lovely, wonderful man who comes from a Minnesota Rural Farm background...there are cultural differences aplenty, as you can imagine...especially at the dinner time, where the 'plonking down' of a gallon plastic milk jug directly onto the dining table is an unfortunate regular occurrence (not to mention the roll of paper towels to be used as napkins, and the use of a tablespoon to eat most types of food) lol! Being of English origin, I have cupboards full of fine bone china, delicately embroidered linens, Crystal glasses, delicate tea cups...all of which languish unused. Ah well, I can read this book and dream of more gracious times...maybe sneak some of that gallon of milk into a crystal decanter? On a more serious note, I realised that my own manners had deteriorated somewhat over the past 10 years or so...I was a nurse in a busy city hospital working night shifts for several years, and 'lunch' (when it existed) was eaten in 10 minutes on the run and consisted of microwave meals or hospital burgers...and my language and general manners were starting to mimic that of my patients (mostly detoxing alcoholics and drug abusers, sadly). Now that I have retired, I can work on bringing back some graciousness into my life and this book has reminded me of many things that I had let go. Time to get back to being the English Lady that I was born to be...maybe some of it will eventually rub off. Of course, not all the suggestions are practical for day to day life...I love to curl up on the sofa and relax, and cooking a three or four course meal every evening would tax both my finances and my sanity, but it's a fun read and nice to dream about. Lynda, thank you for such a fantastic and interesting review of my book. Your image of the milk in the crystal decanter made me smile. I am so grateful to everyone who has reviewed my books online. Thank you! This week I would love to know... have you tried True Match Lumi Cushion? Do you have any drugstore makeup favorites to share with us? Today's video was shot on "one of those days". We were all tired, the house was a mess and kids were being challenging. But, even on days like this, dinner needs to be made! Today I share my sriracha fried rice recipe. It's a quick meal that I make whenever we have leftover rice. 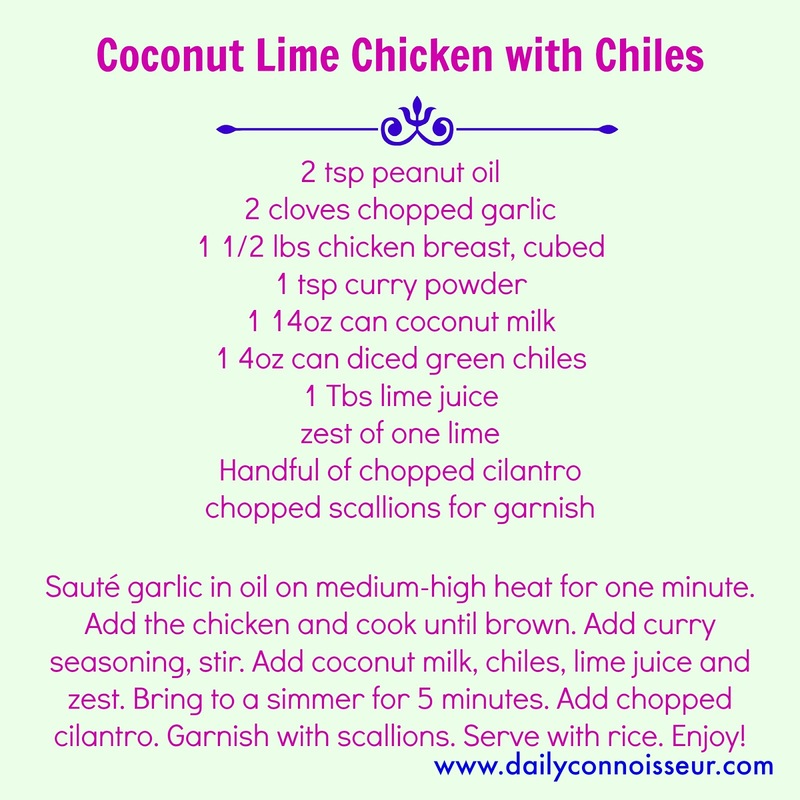 Many times, if I'm making rice, I'll make more than I need and use the rest the next day to make this recipe. I use mixed frozen vegetables because I always have them on hand, but you can use whatever vegetables you like. 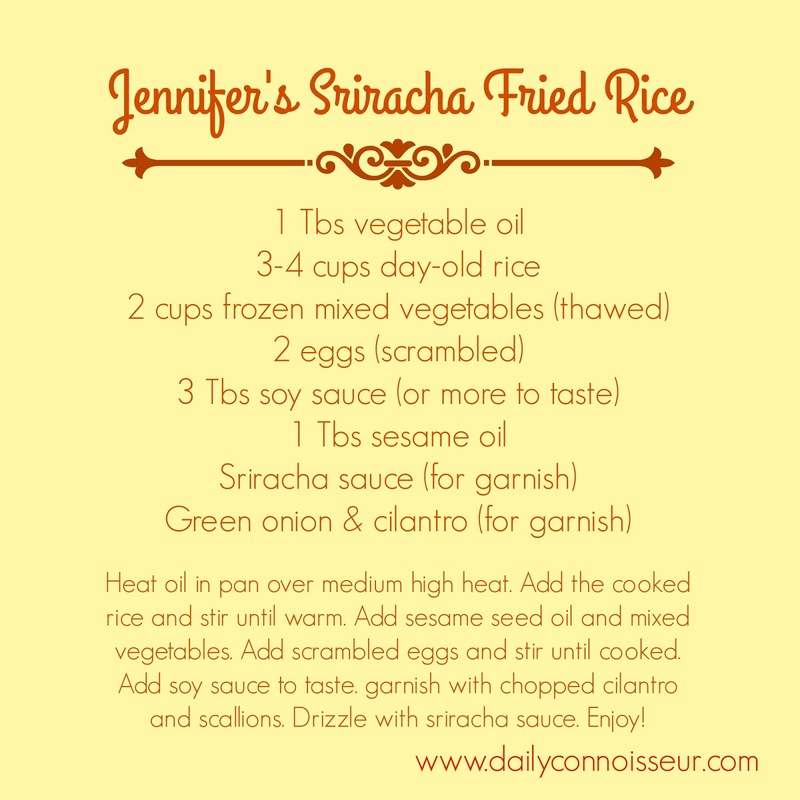 Omit the sriracha sauce if your children don't want their rice to be spicy. The time has come to send you a note of thanks! Since discovering your website about 2 years ago, listening to your videos and reading your first book has had a profound impact on me and the way we run our home. I was mulling over in my mind today about how glad I am for your perspective on life, so I wanted to let you know, and to thank you for the work that you do and the effort you take, and for sharing part of your life with us all. Sending you an e-hug from Australia! P.S. I am very keen to read your second and third books also, but they aren't available yet as e-books. Are there plans for them to be released online in the future? Thank you so much for writing to me, Esther, and for your kind words of encouragement! Unfortunately, the second and third Madame Chic books are not available in Australia (Harper Collins AU did not pick them up after my editor over there left). Many readers order them from Amazon US and read the hard copy. Best wishes to you! I hope you enjoy today's video! 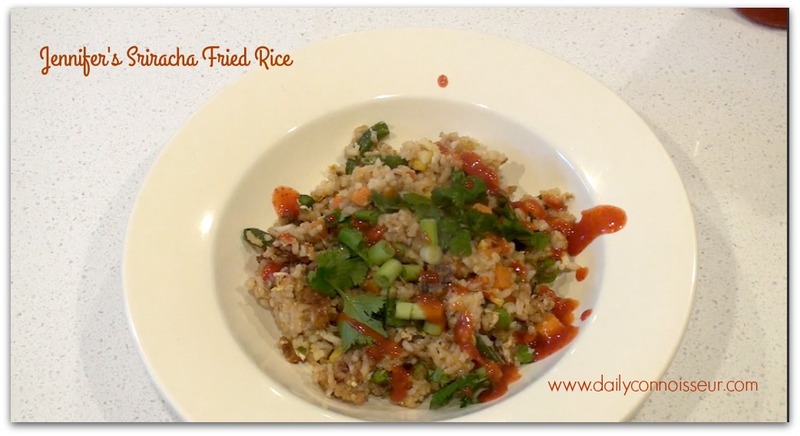 Do you make fried rice at your house? How do you make it? Have you had "one of those days" recently? Share with me and your comment could be featured as comment of the week on the blog. Today's video is a collaboration with Mina Irfan from The Universe Guru. Mina contacted me with this great idea to do a collaboration on 5 Tips for an Efficient Home. Today, I'm sharing 5 tips on my channel, and she is sharing 5 tips on her channel. You can watch her video here. This was a really fun topic for me. I had way more than 5 tips, but I streamlined them to the most pertinent. Prepare the night before Think about what makes your morning hectic. Is it breakfast? Getting dressed? Preparing school lunches? Helping the children get ready? Whatever it is that causes you stress, see if you can take care of it the night before. Set the table for breakfast. Set out the lunchbox and place non-perishables in it. Choose your clothes for the next day. Have your children lay their clothes out. Place all backpacks by the front door. Everyone's nightly to-do list will be different, but you will come to appreciate this added effort the night before to make your morning run smoothly. Embrace routines We live in a world of order and our homes should reflect that. Try to eliminate chaos wherever you can by implementing routines for everything from dealing with the incoming mail to going to bed at night. Run your home like a small hotel What do you like about staying at a hotel? Is it the serene, clutter-free bedroom? The immaculate lobby and reception area? The sense of calm and order? Get excited about running your home, just as if you were the manager of a small, boutique hotel. With this motivation, you will plan your meals with gusto and use your implemented routines to create an orderly and efficient home. Adopt a ten-item wardrobe The benefits of the ten-item wardrobe are vast, one of them being that it makes your home life run more efficiently. Why? Because you are not wasting countless hours choosing what to wear. You are not wasting money on clothes you don't need and aren't your true style. You end up choosing to look presentable every day which boosts your energy and productivity, plus so much more. I hope you check out my video today where I expound on all of these topics, and why I believe they can help you to run your home more efficiently. **Many people have asked which slow cooker I use. Our All Clad slow cooker is over ten years old and our particular model is no longer available. However, I did some research and this Crock Pot slow cooker is Amazon's pick, is very affordable and has excellent reviews online. 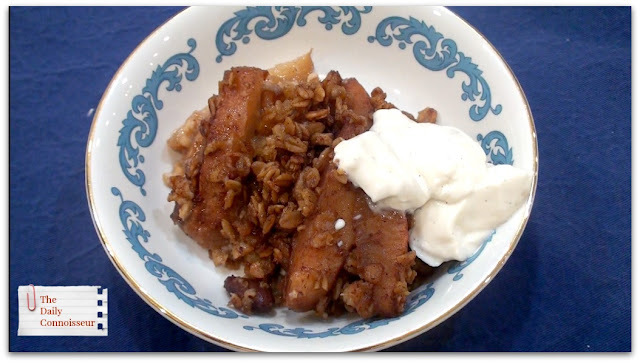 If you are looking for a new slow cooker and you try this one, let me know how you like it! Before reading the Madame Chic series I used to be an offender of wearing yoga pants everyday (I think I am wearing yoga pants in my icon pic :). I too, had the opinion that it didn't matter since I wore a long shirt over and I thought you couldn't tell. I also work from home. But after reading the books, I decided to give it a try. I have to say I have converted. I no longer wear yoga pants daily. I wear real pants. And I will say, "don't knock it til you try it". I feel so much better. I realized that when I was in my yoga pants, I wanted to lounge around, read, or go on the internet. When I am dressed, I am more efficient, more organized and I feel better when I go to the store. I am in a better mood. I love not wearing yoga pants. At the end of the night, early, I take a relaxing bath and put on my pj's and then I relax, pray and listen to some classical or meditation music. So, now I have a place for my relaxation time. I love it!~ Thank you Jennifer for shedding light on this. My cheat is, I found dressy, nice pants, that are just as comfy as yoga pants. I usually wear nice, dressy leggings with a long dress top and ballet flats. Thank you ladies, for sharing your great testimonials with all of us. 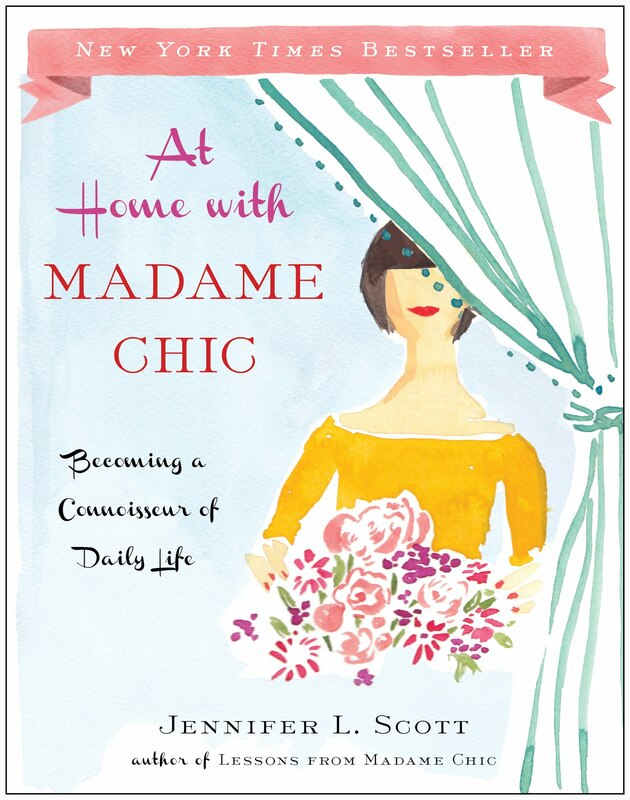 I love to hear how the Daily Connoisseur and Madame Chic philosophies are improving your lives. 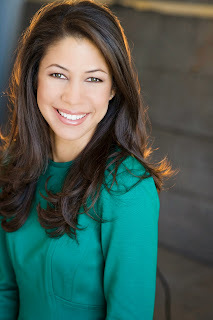 This week I would love to know... What do you think of my tips for running an efficient home? Do you have any to add yourself? Do you struggle with efficiency in your home life? Let me know in the comment section, and yours could be chosen as comment of the week on the blog! I have been following your blog since Autumn of this year. How helpful your advice has been in helping me to keep a calm, well-kept home for my growing family. I am still having some struggles, however, with my personal routine. My children are babies, and I stay at home. I like to get the most messy housework done early in the day, and exercise during nap time around the middle of the day. My goals prevent me from a solid dressing and toilette routine, as I do not want to spend the time on hair, makeup, and nice clothes if they are going to be undone with cleaning and exercise! I would be so grateful for insights into your routine. I am also wondering if you wear clothes from your extras for housework. Thank you so much! Amber's concern is very valid. I receive this question a lot! What is the point of dressing up each day, when it will all be undone shortly thereafter? I answer Amber's question in today's video, along with commentary on an article I posted recently on my Facebook page, that drew a lot of fire: The Chicago Tribune's opinion piece, Unless You're Doing Yoga, Put on Some Real Pants. This article drew a lot of anger on Facebook, but I explain in this video why I think many of its points are valid. I hope you enjoy teatime with Jennifer this week! Also, did you notice? I got a new video camera and microphone! I am stepping up my efforts to make my videos better for you in every way. Thank you for your patience as I get used to using my new technology. My husband and I decided we needed to get back into making weekly dinners. I was writing out our schedule this week and went to check on your post and laughed at our serendipitous topic. In the summer time I often make lunch a big salad, whatever I might have in the fridge or want to put in it varies. I also enjoy tomatoes, fresh mozzarella, olive oil, and salt and pepper! That is very satisfying and maybe add a glass of lemonade. I also LOVE cucumber sandwiches when it is REALLY hot! In the winter/fall I usually have deli meat roll-ups with cream cheese and fruit or carrots. Sometimes I'll splurge and have a PB and J sandwich with my boys! Thank you for sharing what you eat for lunch, Summer. I love to know what other people eat. 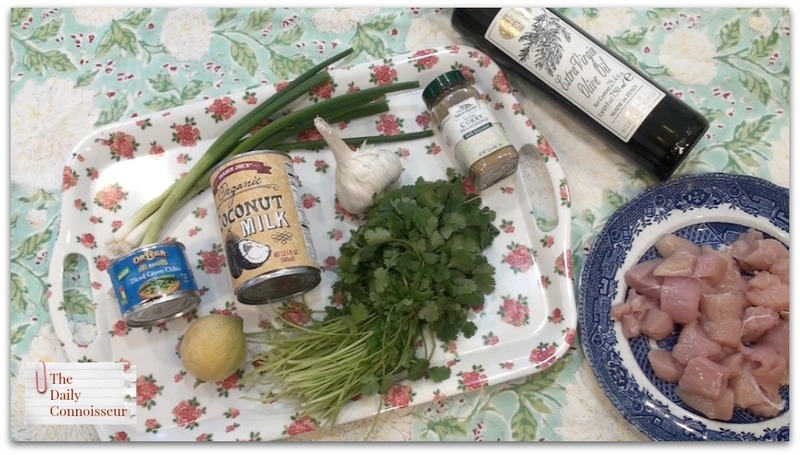 I'm happy to hear that you and your husband are getting back into making weekly dinners! Today I would love to know... what do you think about the thoughts discussed in this week's video? Do you think it's important to dress well every day? Can you get your messy work done in your nice clothes? If you try it, let me know how it goes! What do you think of the Chicago Tribune article? See you Monday!